Turn to the resource that goes beyond basic coding with the Current Procedural Coding Expert, your CPT® coding resource. 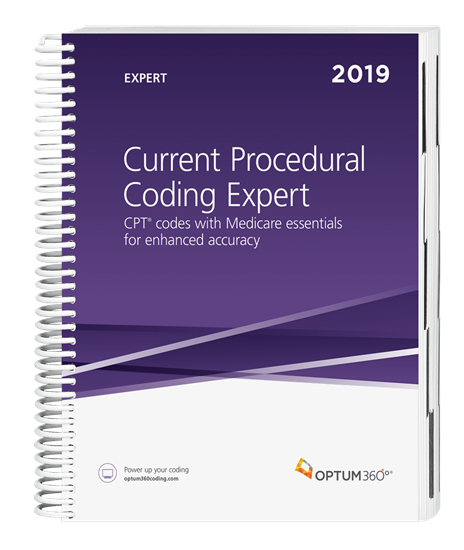 Equipped with the entire 2019 CPT® code set with easy-to-use coding includes and excludes notes for coding guidance andMedicare icons for speedy coding, billing, and reimbursement, this easy-to-navigate resource will benefit physician practices, outpatient hospitals, and ASCs. You will also find a comprehensive listing of annual code additions, changes, deletions, and reinstatements in the appendix; new code icons and notes; plus reimbursement information and mid-year changes not found in the American Medical Association’s (AMA) CPT® codebooks. Optum360 Edge — Code-specific definitions, rules, and references.Reference comprehensive information compiled from the Centers for Medicare and Medicaid Services (CMS), the AMA, Optum360, and other sources to assist with accurate coding and speed reimbursement. Extensive user-friendly index.Find codes in a flash with our accurate and expansive alphabetic index with terms listed in a variety of ways. CCI edit icon. Quickly identify those CPT® codes with corresponding CCI edits. Evaluation and Management appendix. Easy-to-use grids and extended guidelines to facilitate E&M code selection. CPT® Assistant references. Identifies that an article or discussion of a CPT® code exists in the AMA’s CPT® Assistant Use the citation to locate the correct volume. Medically Unlikely Edits (MUEs) appendix.Improve claims accuracy by ensuring CMS compliance through easy-to-access codes and their associated MUE units. Medicare coverage rules with icons and IOM references.Understand which CMS policies apply to CPT®codes prior to claim submission. Some of these icons include ASC payment and OPPS status indicators and IOM policies. Helpful illustrations.Detailed color anatomy illustration appendix. Plus many illustrations at the code levelidentifying specific code-related anatomy. Modifier appendix. Includes CPT® and HCPCS Level II modifiers and descriptions for easy reference for Medicare coding. Brand-name vaccinations associated with CPT®Vaccine names are listed by the CPT® code to aid accurate coding for medications. Appendix with codes used to report inpatient procedures only. Avoid payment denials by making coding errors. Glossary of terms.Increase your understanding of coding, billing, and reimbursement terms to improve coding accuracy. Spiral binding. Allows the book to lay flat for ease of use and durability. Interventional radiology guidance.Access an appendix of illustrations showing interventional radiology vascular families, as well an appendix of grids detailing vascular family order for more accurate radiology coding. Softbound. Less bulky for travel and easy-to-see title on your bookshelf.